At SoCal HT we believe there are many ways to install a home theater. 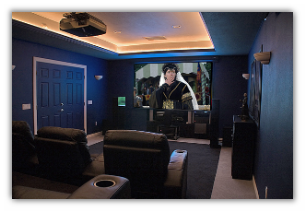 What is your vision of the ideal home theater system? Is it a wall-mounted flat panel television with surround sound for movie night? What about watching Monday Night Football on a plasma television in high definition with your friends? Or it could be a separate room set up with a big screen, projector, lighting, and theater seats. If you have been thinking about enhancing your life with audio visual technology, you are making the right decision. Now, your next steps are deciding what to buy and, most importantly, how you will have the system installed. Why is this so important? Whether it’s a basic television on a stand or an entire home theater installation, the key to maximum enjoyment and optimal performance is proper set up. You could go out and spend hundreds of dollars on the high end, latest technology equipment that is out there and still have it not sounding right due to improper set up. SoCal HT will provide realistic recommendations and make sure your equipment is set up correctly.